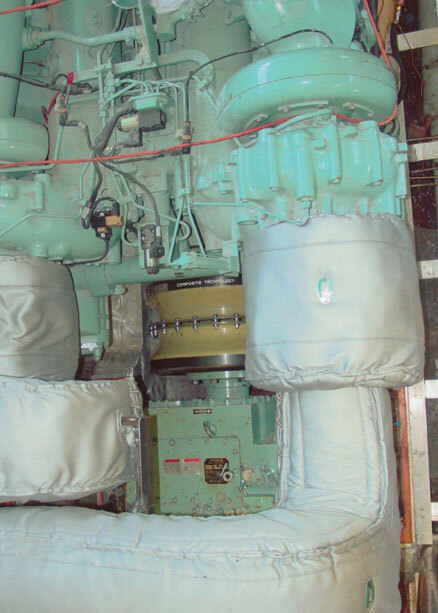 Removable/reusable insulation for very high-temperature applications calls for special consideration. 500 F is the material manufacturer’s temperature limit for both silicone and polytetrafluoroethylene (PTFE), the primary waterproof coatings impregnated into fiberglass fabric to make removable/reusable insulation blankets. In addition, this temperature is just beyond the point where the organic binders that hold many insulation materials together become volatile and burn out. This is also the point where the tensile strength of fiberglass fabrics and threads is starting to decay rapidly. At 700 F, fiberglass fabrics and threads have lost more than half of their tensile strength. Lastly, above 500 F, metals oxidize much quicker than at lower or atmospheric temperatures. Particular care is required when making or installing removable/reusable insulation blankets for temperatures in the 500-to-1000 F range. Silicone- and PTFE-coated fabrics should be kept off hot surfaces where the operating temperatures are above 500 F. Silicone will volatize rapidly and even become highly flammable at temperatures above 750 F. A white silica powder will appear after the organic compound in the silicone has burned off. The silicone burning at very high temperatures will decay the tensile strength of the fiberglass fabric quickly, compromising the overall strength of the removable/reusable insulation blanket. PTFE is a thermoplastic that is very difficult to ignite, and therefore, is much safer in locations where this may be a concern. PTFE will soften at temperatures above 500 F, and even transform to a near-liquid state at between 625 and 650 F. However, PTFE will return to its normal state and yield the same flexible, abrasion-resistant properties when the temperature drops back below 500 F.
Fiberglass fabrics and threads should be reinforced when temperatures exceed 500 F, especially when the operating temperature is above 750 F. Different alloys and wire diameters of stainless steel knitted wire mesh are available to reinforce fiberglass and leached silica fabrics, helping the strength and abrasion resistance of the fabrics and the whole removable/reusable blanket. It is also a good idea to reinforce fiberglass threads with stainless steel staples, hog rings or stainless steel threads when temperatures exceed 750 F. Stainless steel foils with thicknesses of 0.002 inches and 0.003 inches can be used on the hot face and side (gusset) walls in applications such as hydrocarbon services, where wicking into the core insulation must not take place. One of the most economical products to use as the core insulation is a needled fiberglass felt. This product is made from E glass yarn that is chopped, fully opened and then felted together with thousands of barbed needles into a 1/8-inch to 1½-inch-thick insulation mat. This product is manufactured in densities ranging from 6 to 12 pounds per cubic foot, with a maximum continuous temperature of 1200 F, and spikes up to 1300 F. There are no organic binders to burn out, or shot (non-fiberized material) to fall out in this product. Needled fiberglass felt is often used as the hot face insulation composite with a low-density fiberglass on the cold side for this temperature range, yielding better economics. Fastening removable/reusable blankets onto equipment at high temperatures is normally done with 304 stainless steel lacing anchors and tie wire. Caution must be taken when fastening the removable/reusable blankets with belting and stainless steel buckles, so as to not allow the belting to get too hot. Many times, the belting is made from the coated fabric material, and if the coating is compromised, the fabric will not last long. When applying removable/reusable insulation blankets at operating temperatures higher than 1000 F, you need to exercise certain precautions. Many of these applications also have high vibration, such as those found on diesel engine exhaust systems or around steam or gas-fired power-generating turbines. Many of these applications operate continuously where the surface to be insulated is between 1000 and 1200 F, with spikes up to 1500 F.
In these applications, knitted stainless steel mesh reinforcement should be used to reinforce any fabric used on the hot face and side walls. In many situations, it is a good idea to encapsulate the entire removable/reusable blanket at these temperatures. At temperatures above 1000 F, either 0.095-inch or 0.011-inch wire thickness should be used when 304 stainless steel is the material choice. Oxidation will corrode through 0.008-inch thickness in a relatively short period of time at these temperatures. 316 stainless steel, Inconel® or monel wire is sometimes used in very corrosive environments. In the best of environments, fiberglass fabric will retain up to 25 percent of its original tensile strength at 1000 F and should not be used above this temperature. If a fabric is required above 1000 F on the hot face or side walls, leached silica, wire reinforced ceramic, or alumina-boria-silica fabrics are a better choice to help encapsulate the core insulation. If a coated fabric is required on the cold face, PTFE will hold up better and is safer to use than silicone at these temperatures. The seams should be constructed with stainless steel staples, hog rings or a tested, reliable stainless steel thread. Fastening removable/reusable blankets at these temperatures is normally done with 304 stainless steel lacing anchors and tie wire. The core insulation for these very high temperatures should be a needle felted, E glass, leached silica, a composite of the two materials, or a ceramic fiber blanket. Ceramic fiber and mineral wool blankets should not be used if the high temperature application vibrates. Ceramic fiber blankets will lose much of their thickness and density when the product’s shot and short fiber shakes to the gravitational bottom of the blanket due to vibration. Mineral wool will also fail due to the binder burning out; then, the vibration will shake the material apart. To be an effective core insulation for removable/reusable insulation, the flexible mat or blanket insulation must also hold up to the extension handling after being in service for extensive periods of time. Not many insulation blankets can perform to this standard.